Dear Salvation Army – You Are Home to Many! General Booth’s vision for the army was one of safe harbor for the countless souls drowning in the billowing waves of sin. Today that sea still ebbs and flows, still jostles people about, still causes souls to drown in their depravity. The Salvation Army is still here ready to pull victims from the waters, prepared to love them regardless of who they are and where they’ve been. The army has become home to the homeless and a home to others whose “home” was a constant battlefield of alcoholism, drug abuse and physical violence. To many the word “home” brings up anxiety, fear and sadness. Many have never lived within a place that was filled with love or acceptance. Too often, through abuse and selfishness, children have grown up fearing “home” and have lingered in Army halls and youth programs and even schools because the thought of “going home” meant pain and hurt. We as an Army of Salvation can reshape the the word “home” to mean hope and love and family again. Sometimes it means reporting abuse (which is never easy to do but necessary). Sometimes it means that we take the initiative and visit the homes of those we minister to in our corps. Sometimes it means simply being available to youth and even adults who need a place to hang out and someone to talk to. I have heard many stories of individuals that came to The Salvation Army because we were open and we became their safe harbor. In order to escape a less than perfect home they participated in as many programs at the corps as possible and even went to summer camps just to get away. Through these available programs and through the wonderful summer camp ministries we, unknowingly at times, are reshaping what “home” is to many. We are replacing the dread and hurt of the word home and in its place we are instilling encouragement, love, peace, joy and hope! Let us not become prideful in what we can accomplish in the lives of other, but may we continue to strive to be a home changer in the lives of those we serve! Do not become hardened or calloused by the works of your hands while giving out hope as a precious commodity, instead take the initiative and share Christ’s love regardless of how you feel! We may never know the kind of impact that we have had on the lives of those we welcome into our corps! You ARE making a difference for the kingdom through your faithfulness to Christ and in your love for others! The young child who attends a youth program at your corps may one day join our ranks as an officer and boldly declare Christ and give a witness that if not for YOU they would not have known that anyone really cared for them. You are Home! The single mom who is broken and burnout on life and still has to make ends meet and find time to love her children may one day declare that if it hadn’t been for The Salvation Army and for YOU that she may have ended her life or simply walked away from her family because the pressures of life and depression had emptied her of the last ounce of hope. You are Home! Be a refuge of faith. 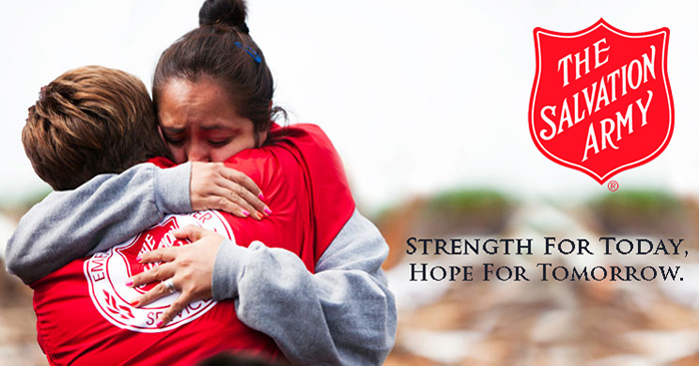 Dear Salvation Army, continue to be that light of hope to the hopeless, the disparaged and the desperate. You are HOME to so many! Just another thing for the Army world to ponder today.